If you control a WIND Winged Beast-Type monster: Until the end of this turn, negate any monster effects your opponent activates. 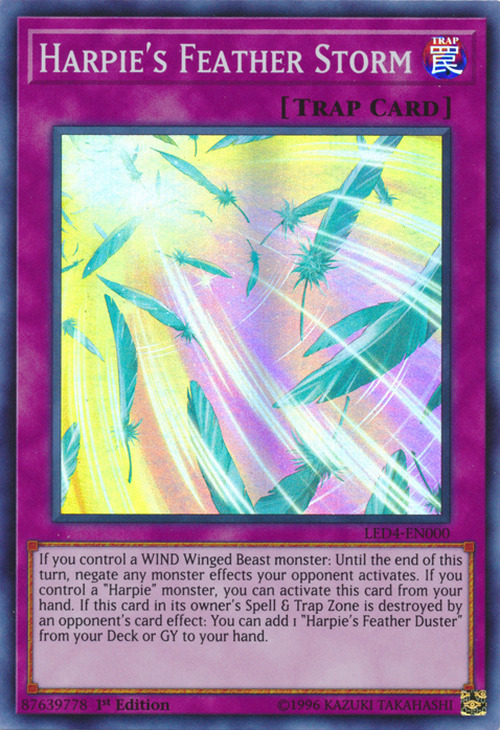 If you control a "Harpie" monster, you can activate this card from your hand. If this card in its owner's Spell & Trap Zone is destroyed by an opponent's card effect: You can add 1 "Harpie's Feather Duster" from your Deck or Graveyard to your hand. This card, Harpie's Feather Duster, Harpie's Pet Dragon and Harpie Lady Phoenix Formation are the only Harpie cards that haven't been censored in the TCG, due to the fact they are also the only ones to not be or feature a Harpie monster. This card's last effect has never been usable in the TCG Advanced Format, as Harpie's Feather Duster has remained banned since this card's release. This card's name, artwork and theme are very similar to Feather Wind.